First of all, the gladioluses amaze with a variety of kinds. There are almost 60000 of them in the world now, although about 40000 are already forgotten and exist only in old books and catalogues. About 100 new kinds are registered in the International List of Gladioluses every year, but there are at least five times as many that are not in this List, or are registered only in one particular country. In order to help flower-growers find their way in this sea of varieties, the North American Gladiolus Council (NAGC) accepted a common classification, which today is used all over the world. But all the varieties that we can see in gardens, shops, and at exhibitions, are only multiple hybrids of wild gladioluses. European flower-growers noticed them in the 18 century. 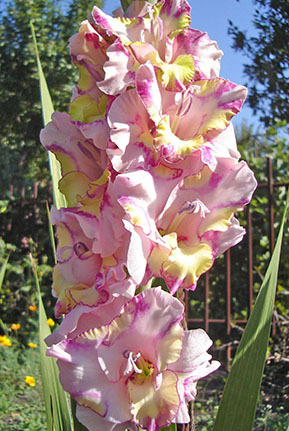 Actually, about 250 various species belong to the class Gladiolus, and Gladiolus Hybrid is only one of them.